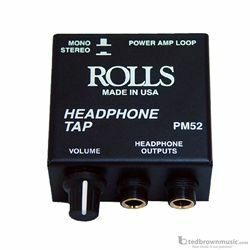 The PM52 is for connecting headphones to a speaker line. The 1/4" Mono/stereo loop jacks are for connecting many boxes in series. There are 2 headphone jacks and volume control. The PM52 uses the speaker line signal for power, and uses no batteries. PLEASE NOTE: THE PM52 REQUIRES A MINIMUM OF A 10 WATT AMPLIFIER TO FUNCTION PROPERLY.